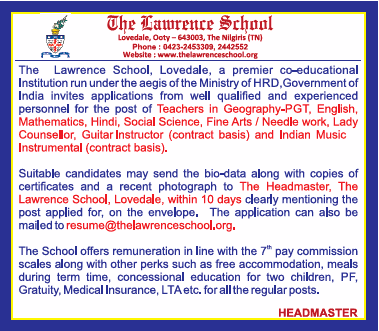 The Lawrence School, Ooty has advertised in THE TIMES OF INDIA newspaper for recruitment of Teachers PGT jobs vacancies. Interested and eligible job aspirants are requested to apply within 10 days from 12th Sept 2018. Check out further more details below. About School: 'The Lawrence Asylum' was built as a memorial to Major General Sir Henry Lawrence, CB, BT, LT.COL., ADC to Queen Victoria, K.CB, who early in 1856 offered a sum of Rs.5,000 down and Rs.1,000 per annum if action were taken to found, at some Madras hill-station an Asylum similar to those already established at Sanawar and Mount Abu. In February of 1856, a meeting was held in Ootacamund to make every effort to carry out the project. How to Apply: Interested and eligible candidates are requested to send applications along with CV, copies of certificates, PAN card, Aadhaar card and PP size photos to the email address or postal address given below. Clearly mention the post applied for on the envelope.